Angela, our children and I live in the Southern Highlands of NSW. This region has a rich history of supplying fruit into the “Sydney Markets” in Flemington. We have wonderful soil and the perfect climate to do this, not to mention generations of orchard knowhow. Proper locals talk of the railway station, stacked with wooden crates filled with perfect apples, pears, stone fruit and anything else sun-ripened and delicious that would fetch a price to put bread on their table and maybe a spring in their step. This was 60 years ago. 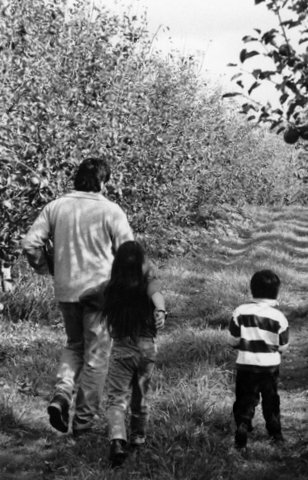 When we moved into our family farm in the early 1990’s, there were only five or six orchards remaining in the area. The first story I ever recorded for television in 1992 was an attempt to shine a light on the decline of our local fruit-growing heritage. Ian Smith – lovely guy and a long time local orchardist was interviewed, and told the oh so familiar story. It seemed that overnight, Australian shoppers were introduced to and started preferring Fuji, Pink Lady, Gala, Royal Gala and other wonderful varieties of apples. It was impossible for orchardists to hear the warning bell. When elephants jump, the ants start running. Meaning, when the large retailers make a move, everybody else is forced into line, and now, new apples were on the shopping list. If you only had the old varieties, grown in the old, now less productive way, you were going to be left behind. Tasmania, known as the apple Isle, almost went pear shaped. Today, in the Southern Highlands of NSW, I believe we have one remaining orchard. The other ugly engulfing trend affecting farming, was the emergence of the large farm driven by technology. 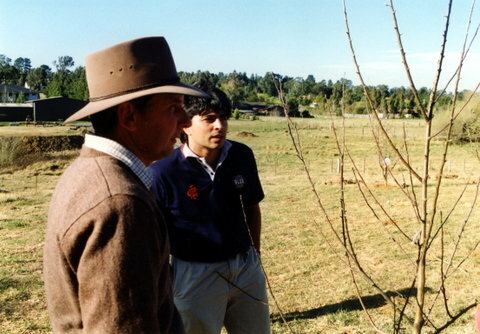 As the next generation of farming offspring headed for universities and agricultural tertiary centres, they returned with business models, IT capabilities an understanding of marketing, different packaging, chemical and storage options, and the desire to get ahead of their competitors with tactics and strategies weighing in more powerfully than the ability to grow good fruit alone. The small orchardist, with hand pruners, a 125 horsepower Massey Ferguson tractor and a border collie couldn’t compete, especially if their children wanted a life off the land. Couple that with increasing rates, and not so slowly, and very surely the small ones disappeared. Business is business, and I don’t begrudge anyone developing a market edge. But, where are the so-called industry bodies, the local, state and federal Government, and the responsible retailers who might have stepped in to preserve the wonderful fruit growing regions and the farming communities? The wonderful soil and perfect climate in our area, now grows housing estates. 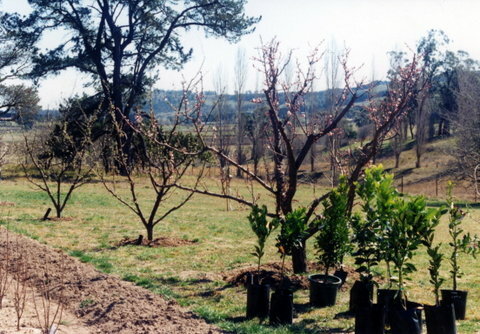 We visited most of the local orchards 20 years ago and purchased their favourite trees. Talking, the third tree on the fifth row; the only fruit from which Nan would make her apple crumble. We transported them (illegally) at night and planted them with 100% success and 1000% understanding that we were inheriting another family’s soul. In this section of the website, you will become acquainted with these trees, learn how we care for them and what we do with the fruit. With the help of experts, we hope to give you all the insights you need to do the same. I’m about to introduce you to my new orchard heroes, Geoff and Heather Brooke from Ryset. Geoff being the orchard guru who helped me reinvigorate my two year neglected trees, and Heather documenting our every step and putting up with our supposedly lame jokes.